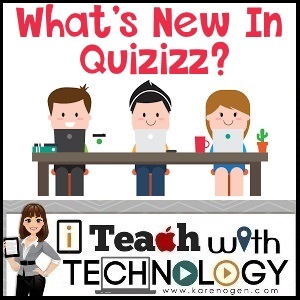 Karen Ogen- i Teach With Technology: What's New in Quizizz? Quizizz.com is one of my favorite online, game-based, review sites. With the recent updates to the site, there are even more reasons to use Quizizz with your students. If you do not know about Quizizz, you can learn more here. 1. Create your own correct/incorrect memes. One of the fun features of Quizizz is the memes that pop up after students answer questions. Now you can create your own. There is a built in meme editor or you can upload your own if you like to create them with meme apps or other sites. What's even more fun? Have your students create the memes! 2. Share to Google Classroom. When starting a quiz, you can now push your quiz to your Google Classroom account for an easy share. This is a super option especially if you are assigning a quiz as homework or as independent learning. With this option, there is no need for students to type in the web address and the quiz code- the link in Google Classroom will connect your students directly. Yes, print is dead for me, but you may have the need to have a hard copy of your quiz or print to file. Now you can. 4. Create a quiz from an import of data. Now you can upload a .CSV file and automatically populate your quiz information. If you are not sure how to do this, just click on the option and download a sample file. I hope you find these new Quizizz features as useful as I do!